Other Physical Attributes: athletic build; crescent shaped birthmark on his chest, just above his heart. Chris is a fourth generation member of the Utopia Planitia colony on Mars. His great grandfather, Joseph Stingley arrived with the first colonists to arrive to the planet in the 2060s. Since that time, his family has been proudly affiliated with the growth and development of the Mars colonies. 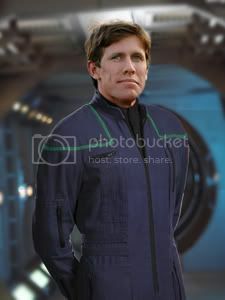 Joseph was involved in the first terraforming efforts on the planet, and was also one of the early representatives in the negotiation of the Fundamental Declarations of the Martian Colonies in 2103. Chris's grandfather, Mars, worked as a communications technician for the colony, starting a family tradition that would be followed by Chris's father Michael, as well as himself. From an early age, Chris found fascination in intrastellar communications. In his early teens, he began constructing amateur communications arrays from old parts his father was able to obtain from the colony surplus. He spent many hours chatting with other amateur operators living on Earth and even Jupiter. With such a wide array of contacts, Chris developed an interest in languages - achieving functional fluency in five Earth languages through self study by the time he was 20. Following these interests, he moved to Earth to pursue university studies and obtained a degree in linguistics from the University of San Fransisco prior to entering Starfleet Academy. Chris has always enjoyed hiking and rock climbing as hobbies, starting as a youth on Mars, and continuing while studying on Earth. While interested in the science of language and communication, he has a tendency to shyness and anxiety in social situations. This shy nature has been reinforced by years of indirect communication with his amateur transmitters, as well as his enjoyment of spending time camping and hiking in solitude.